PT Jasamarga Bali Tol - PT JBT or known as Jasamarga Bali Tol is a reputable toll road management services company in Indonesia. 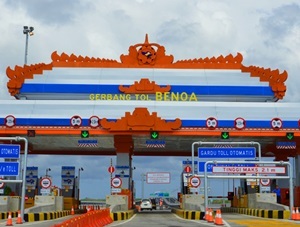 Based in Denpasar Bali, Jasamarga Bali Tol operates primarily as a toll-road operator of Nusa Dua-Ngurah Rai-Benoa Toll road in Bali Province which covers 10 kilometers. The Company formed on 22 Augist 2011. Jasamarga Bali Tol has Toll Road Concession Rights Agreements with the Indonesian Toll Road Authority for Nusa Dua-Ngurah Rai-Benoa toll road up until 2057. PT Jasamarga Bali Tol is a member of state-owned PT Jasa Marga (Persero) Tbk or Jasa Marga Group, a leading state-owned toll road company in Indonesia. At present, PT Jasamarga Bali To is 55% owned by Jasa Marga Group. Another 45% are owned by PT Angkasa Pura I (Persero), 8.00%; PT Pelabuhan Indonesia III (Persero), 17.58%; PT Pengembangan Pariwisata Bali (Persero), 1.00%; PT Adhi Karya (Persero) Tbk, 1.00%; PT Hutama Karya (Persero), 1.00%; Bali Provincial Government, 8.01%; Badung Regency Government, 8.01%; and PT Wijaya Karya (Persero) Tbk, 0.40%. PT Jasamarga Bali Tol performance achievement throughout 2016 showed satisfactory results. According to PT Jasa Marga (Persero) Tbk Annual Report 2016 as cited by JobsCDC.com, PT Jasamarga Bali Tol reported an 16.7% increase in total revenues of Rp145.3 billion in 2016 as compared with Rp122.7 billion in 2015. Referring to its annual report, the number of transaction volume in 2016 grew by 5.6% to 17.5 million transactions from 16.5 million transactions in 2015. Never experienced any termination from Government Institution/BUMN/BUMD/Private agency for disciplinary offenses. Age at selection : minimum 18 years old and maximum 22 years old. Graduates of State or private education institutions with minimum accreditation B.
Preferably athletes with proof of award certificate (badminton, tennis, futsal, volley ball). JobsCDC.com now available on android device. Download now on Google Play here. Please be aware of recruitment fraud. The entire stage of this selection process is free of charge. 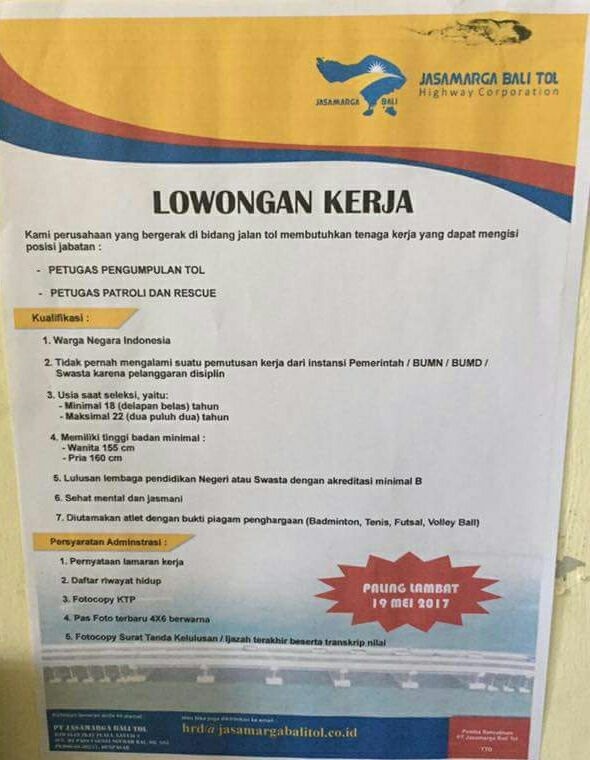 PT Jasamarga Bali Tol - Recruitment Operational Staff Jasa Marga Group May 2017 will never ask for fees or upfront payments for any purposes during the recruitment process such as transportation and accommodation.